So we know that Honeycomb is tablet-centric. But what does that entail? Tablet application developers can rejoice now that Google has released its software development kit for Android 3.0, the new edition of the platform designed specifically for tablets. Dubbed "Honeycomb" by Google, the new platform will be the first edition that will support applications and programs designed specifically for the large touchscreens of tablet computers. Although tablets such as the Samsung Galaxy Tab have run on older versions of Android, Google has said that tablets based on non-Honeycomb editions of Android will not properly run applications downloaded from the Android App Market. On smartphones, Android's browser lets you open several websites at once in different "windows" that you can switch through by clicking on a button and accessing the windows screen. This makes sense for smartphones, since having traditional browser tabs would clog up the devices' limited screen size. 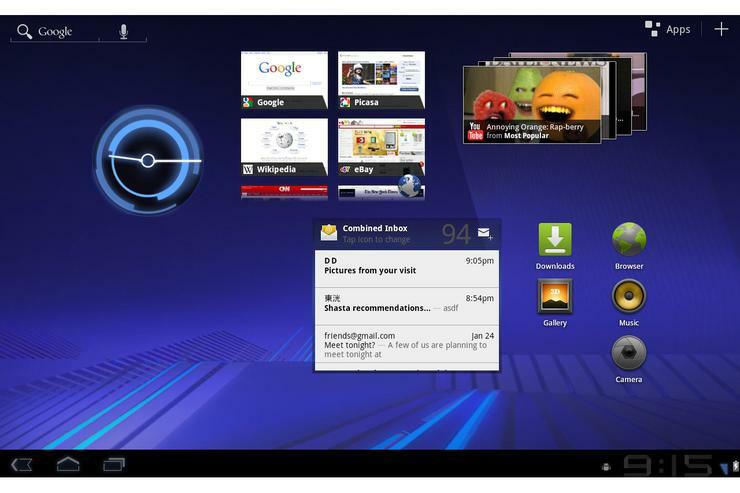 But for tablets, the "windows" feature could quickly become a royal pain. This is why Honeycomb's browser will support browser tabs, meaning your browsing experience on Android tablets will now be more like the browsing experience on your desktop computer and less like the browsing experience on your smartphone. * Easier Gmail with two columns and "Action Bar"
Unlike smartphone-based Android versions of Gmail that simply presents messages in a long single column, the Honeycomb version will be divided into two columns that will let you more easily navigate and manage messages. So instead of having to click over for a separate window to look at sent or deleted messages, you'll be able to click on their folders on the left-hand column. But that's not all! Google is also promoting the exciting-sounding "Action Bar" as a key feature of Honeycomb Gmail. Per Google, the Action Bar is "always present when an application is in use, although its content, theme, and other properties are managed by the application rather than the system." In the case of Gmail, the Action Bar will be used primarily to move messages from folder to folder. Andy Rubin first demonstrated Honeycomb's new 3D graphics capabilities late last year by showing how a prototype Motorola Android tablet could now support a 3D version of Google Maps that featured 3D renderings of houses and buildings. Google has now given us more details about its tablet-centric 3D graphics engine, dubbed Renderscript, which it describes as "an ideal way to create high-performance 3D effects for applications, wallpapers, carousels and more." According to Google, Renderscript is both an API for 3D graphics that also provides a "platform-independent shader language" that will help developers achieve more realistic shading and textures in their 3D work. Android got its first major enterprise update last summer, when Android 2.2 ("Froyo") hit the market. Among other things, Froyo gave IT departments remote wipe capabilities and password enforcement capabilities, while enterprise users got support for Exchange Calendars and auto-discovery to make it easier for users to set up and sync Exchange accounts. Google says Honeycomb adds to Android's existing enterprise features by giving enterprise application developers support for "new types of policies, including policies for encrypted storage, password expiration, password history, and password complex characters required." And finally, Google made sure to redesign its Android keyboard for larger tablet screens by addeing "reshaped and repositioned" keys that are better suited for typing by the whole hand rather than just one or two fingers. And not only that, but there's a Tab key - no more using the space bar multiple times to indent new paragraphs! Touch-holding certain keys will also open up menus for special characters - so for instance, if you hold down the "e" key you're likely to get options that will let you insert "é," "ë," or "ê." While this is certainly a useful feature, you'll need to remember not to hold your hand in one place too often while typing, unless you want your formal document to look like a lyrics sheet from a German metal band. Additionally, Google says it has also changed its cut-and-paste functionality for tablets by letting users "quickly select a word by press-hold and then adjust the selection area as needed by dragging a set of bounding arrows to new positions." The aforementioned Action Bar is also on hand to give users quick cut, copy and paste options.